volcanoes and discovered that 10 of them had active hydrothermal systems. eruptive style, chemical composition) from those found along the mid-ocean ridge. Giant smoky plume discovered pouring out of "Brimstone Pit" crater near the summit of NW Rota 1 volcano. The first site found (above the pit) was a large area of sand with shimmering water percolating through it. Inserting a temperature probe in it yielded a temperature of over 100 C! A huge amount of heat and highly acidic fluid is coming out of this large area of sand. NW Rota. 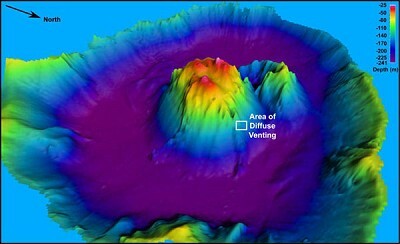 The volcano rises to a height of 535 meters below sea level. Its base is over 2000 meters deep. Brimstone Pit is near the summit of the volcano at 555 meters depth. almost engulfs the vehicle in an ash plume. 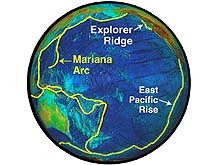 Video courtesy of Submarine Ring of Fire 2006 Exploration, NOAA Vents Program, NOAA-OE. organized into several distinct layers, suggesting that multiple vents were discharging fluids of differing temperatures. Unusual spiny crab spotted on NW Rota 1 volcano. Crabs are opportunistic predators at vent sites. The body of this crab is ~2 in. (~5 cm) across. The unusual chemistry here indicates that at least some of the vents on NW Rota #1 are rich in sulfuric acid. 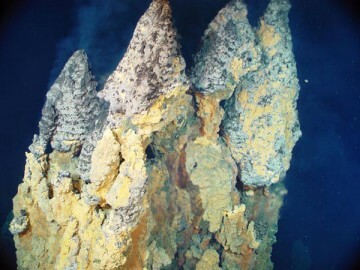 Sulfur is a rich energy source for the microbes that live in hydrothermal systems. 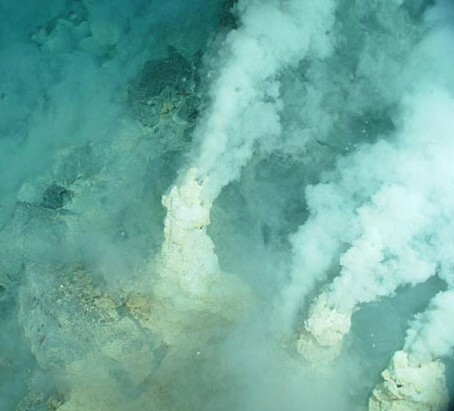 All other life in the hydrothermal ecosystems depend on these microbes. 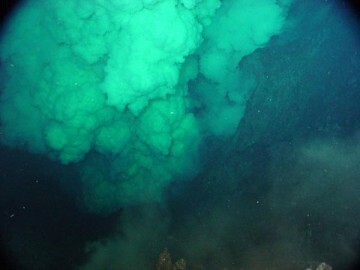 Chemical analysis of the plumes showed that they were among the most unusual ever found above a hydrothermal source. in addition to high concentrations of sulfur, iron, and manganese. Active smoker chimneys precipitating iron, copper and zinc sulfides from 230ºC fluid. here about 30 cm tall, commonly sit on top of these structures. chimneys (named the Black Forest) upslope of Barnacle Beach. black smoker chimneys at Black Forest vent field. The chimneys rise up to 7 m tall. 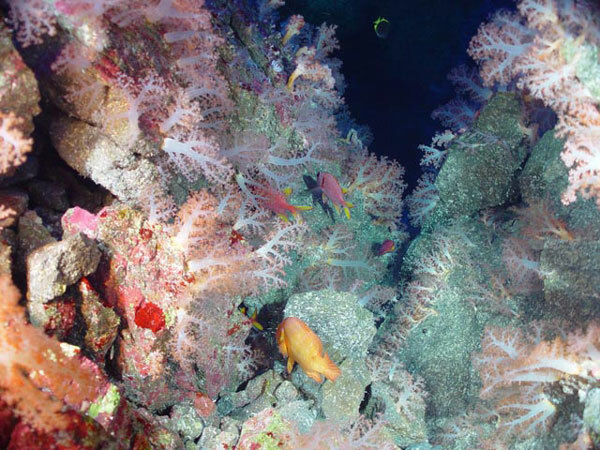 which includes algae (red and green), soft corals (pink with white stalks) and tropical fishes. 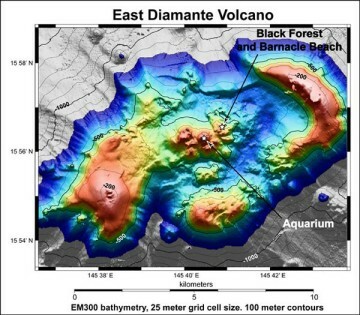 which shows the affects of hydrothermal fluid boiling on the sea floor. chimneys 7-9 m high that spewed black smoke into the surrounding seawater. where streams of bubbles (gas) emanated from one part of the chimney while hot liquid escaped from a different part. 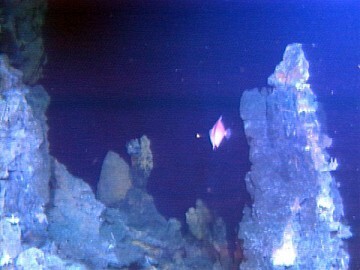 On the summit of East Diamante (170 m, 558 ft depth), all signs of hydrothermal venting have disappeared. 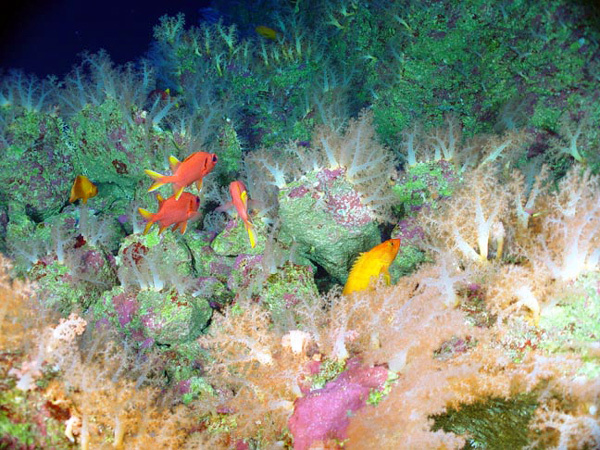 Soft corals (~10-15 cm or 4-6 in tall) and tropical fish share the paradise named Aquarium." Higashi-shima (East Island) in the foreground, and Nishi-shima (West Island) in the background. about 20 m of the sea surface. 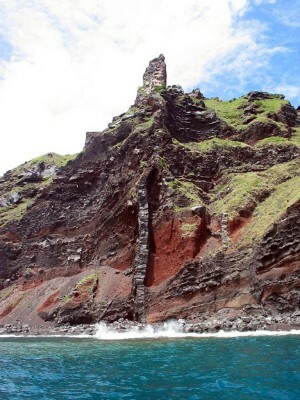 No eruptions are known from the Maug Islands since their discovery by Espinosa in 1522.
only 227 m above sea level; the submerged southern notch on the caldera rim lies about 140 m below sea level. White chimneys at Champagne vent site, NW Eifuku volcano. The chimneys are ~20 cm (8 in) across and ~50 cmhigh, venting fluids at 103ºC (217ºF). 1,650 meters (more than 1 mi) below sea level. Small white chimneys vented cloudy white fluid at the site. Surprisingly, bubbles composed of some sort of fluid were rising out of the sediment around the chimneys. 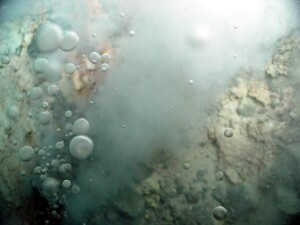 Bubbles have been seen before in hydrothermal systems, but never in such great abundance. Close-up of bubbles at the Champagne Vent. bubbles in that they had little tendency to fuse into larger bubbles, even when touching each other. weight of seawater pressure is removed. A tremendous mussel biomass adorned the lava ridges at the crest of NW Eifuku volcano. They were attached by sticky threads (known as byssal threads) spun by each animal's foot. - they were very similar to their intertidal cousins. 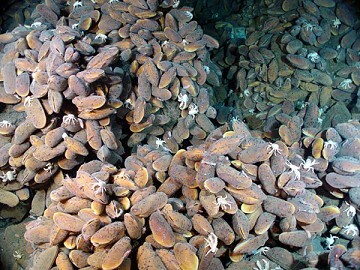 At NW Eifuku volcano, mussels are so dense in some places that they obscure the bottom. The mussels are ~18 cm (7 in) long. 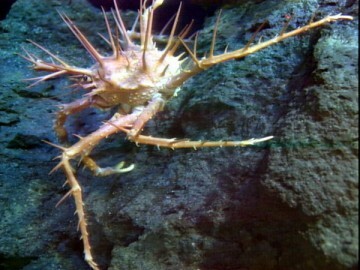 The white galatheid crabs are ~6 cm (2.5 in) long. but there was no temperature anomaly in the water around the mussels. 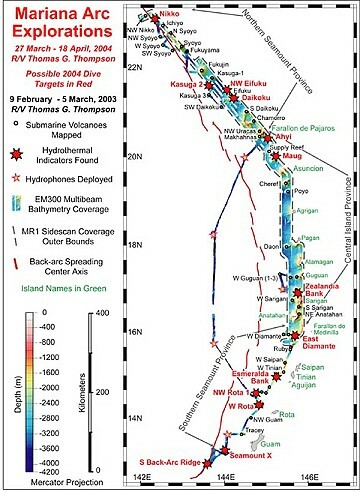 This report is based on the "Submarine Ring of Fire 2004: Mariana Arc Expedition "